You’ve never heard the Messiah like this! 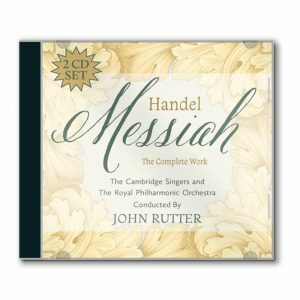 Combine the premier choral conductor of our time; the elite Cambridge Singers; the Royal Philharmonic Orchestra; and Handel’s timeless Baroque score, and you have the ultimate musical celebration for Christmas or Easter! Every word on this 2-CD set comes from Scripture and exalts the name of Jesus! The prophetic words of Isaiah, Haggai, Zechariah, and Malachi will help you anticipate the coming Messiah. And then, in the words of Matthew and Luke, the angels suddenly appear to the shepherds singing that familiar chorus, Glory to God in the highest! Peace on earth, good will towards men.